MUHAMMAD YUNUS VISITS FAIR FINANCE: “Making money is happiness. Making other people happy is super happiness." 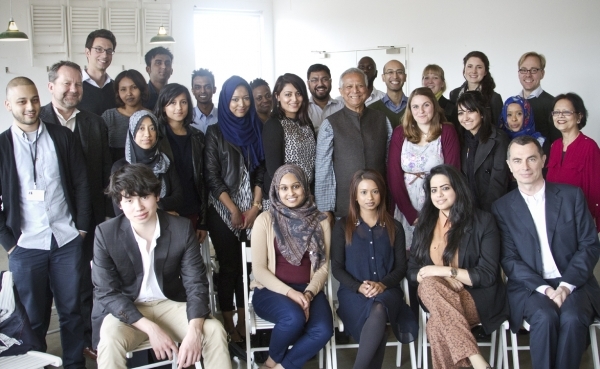 On Friday 18th May Muhammad Yunus spent the afternoon with Fair Finance and its staff. The microfinance pioneer and founder of the Grameen bank spoke on a wide variety of topics, covering numerous experiences from the decades he has spent combating global poverty and gave us some great insights into what keeps him motivated and how we can stay true to our mission. Md Yunus is probably best known for the creation of Grameen Bank, which has its roots in a village in Bangladesh and is now an internationally renowned institution with over 2500 branches worldwide. These branches include 12 in New York and Grameen UK, soon to launch in Glasgow, answering the question often posed to Muhammad Yunus: ‘Will it work in rich countries?’ He explains that there is always a need for microfinance, no matter how ‘developed’ or wealthy a country is: the mainstream financial system is not extended to the most poor, leaving an entire portion of the population excluded from fair credit. Md Yunus spoke passionately about the creation of social businesses, explaining the need for money making companies to transform into problem solving companies. The key aim of a company should be to tackle a social issue, rather than simply just the increase of its shareholder’s wealth. Perhaps the overriding lesson to be learnt from Md Yunus’ visit is the need to place the human at the centre of a business. As he told us: “Making money is happiness. Making other people happy is super happiness." It was truly an honour to receive this visit from such a renowned ambassador of social change, and a great endorsement of Fair Finance’s hopes, successes and ideals. In many ways Fair Finance has been trying to prove that the principles that provide the foundation for the Grameen’s success in Bangladesh can be replicated in the UK. Our work over the last 7 years tackling financial exclusion definitely proves that we’re on the right track and that it is possible. Md Yunus’ visit is a great endorsement of the progress we have made and encourages us to try and make the kind of change he has achieved in Bangladesh. Andrew: “I learned that you need to make an income (profit) on every practice in order to find sustainability. Providing items such as wells and creating homes in very poor communities doesn’t necessarily generate an income, it does however create the opportunity for those affected people to then start working and improve their lifestyles so they can then generate an income. Jahanara: I thought he was inspirational in the simplicity of his ideas and hugely creative in how he can visualise and execute them in the form of a sustainable and profitable business. He epitomises what we term in Fair Finance as ‘hard headed but soft hearted.’ The two are not in conflict!